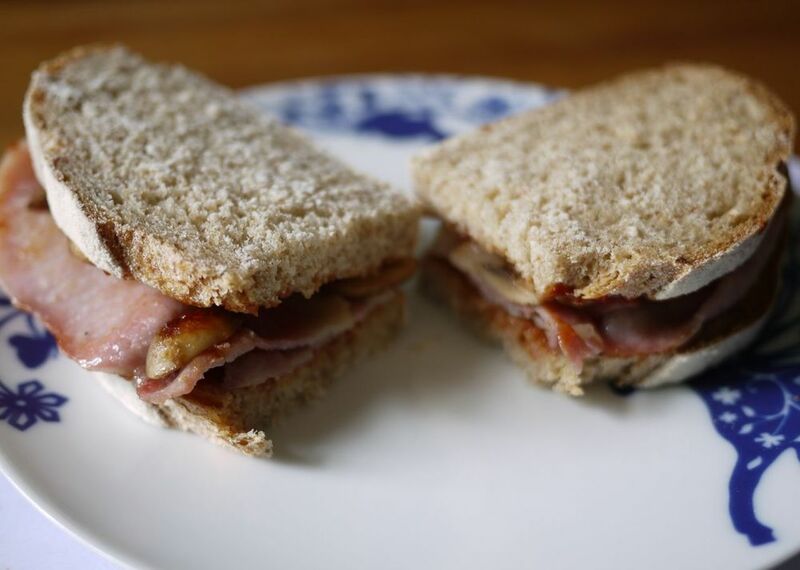 I love bacon butties. So much so that I have one nearly every weekend. So when the people at Denhay Farms said could they send me some of their bacon to try, I was hardly going to argue. In fact they sent me everything I needed to make a bacon butty bar the bread. Fortunately I’d just baked a loaf. I know there will be howls of protest from some of you that its on brown bread. Tough. I like it on brown, or white. It’s pretty much the hottest day of the year and I’m about to eat a full Christmas dinner in deepest Berkshire. Just what is going on. Especially as I’m not turkey’s number one fan. It’s okay but to date its not had a guaranteed place on my christmas table…. When I was a kid we always had roast turkey for Christmas dinner and it was good, but it never seemed as nice as the excitement it generated amongst everyone else. For me it was never quite a tasty and juicy as roast chicken. Maybe the plethora of trimmings overshadowed it …. what with tons of chipolatas wrapped in bacon, my mum’s top notch roast potatoes and my gran’s secret chestnut stuffing I’m not sure the turkey had much of a part to play. At least not for me. So once I got to be in charge of cooking christmas dinner I varied what was on offer. If we were having turkey cooked for us elsewhere close to Christmas. I’d cook something else. If we were hosting the main event I’d stick with turkey (and still secretly wish it could be chicken we were having), if there was just the two of us well then I had free rein beef, duck, goose,chicken, pork, ham all possibly except lamb eaten over the years. So is this turkey different? Well for a start I know a lot about where its from and how its been reared. On the basis that an animal that has lead a happy life is supposed to taste better then this has all the hallmarks of being winning. It’s also been cooked by Brenda Copas and is about to be carved by her husband ‘Old Tom’. What the Copas family don’t know about rearing, cooking and carving turkey probably isn’t worth knowing. 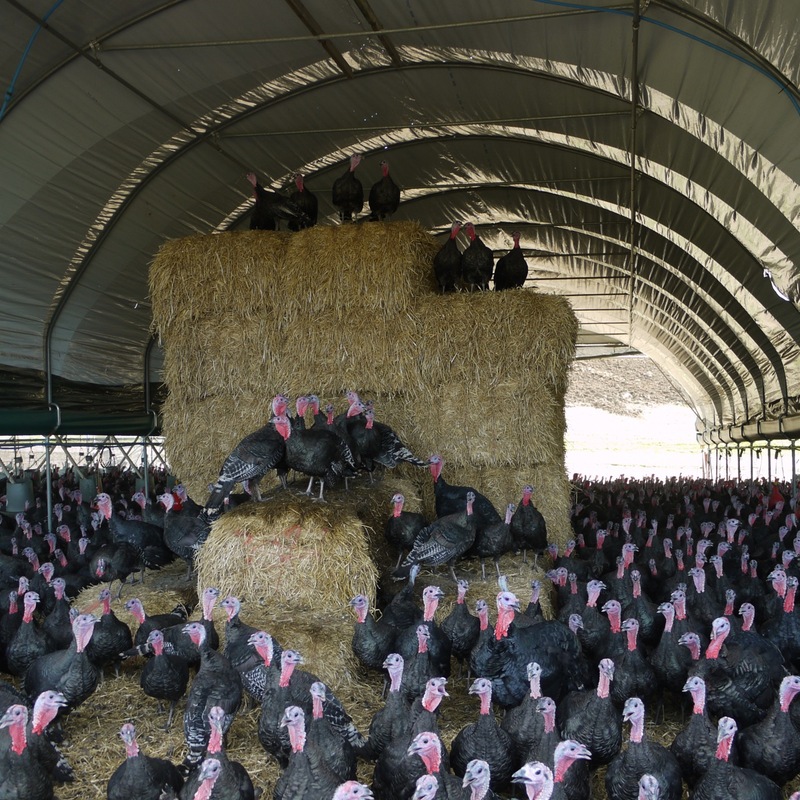 They’ve been rearing turkeys since 1957 and still use traditional methods and breeds. 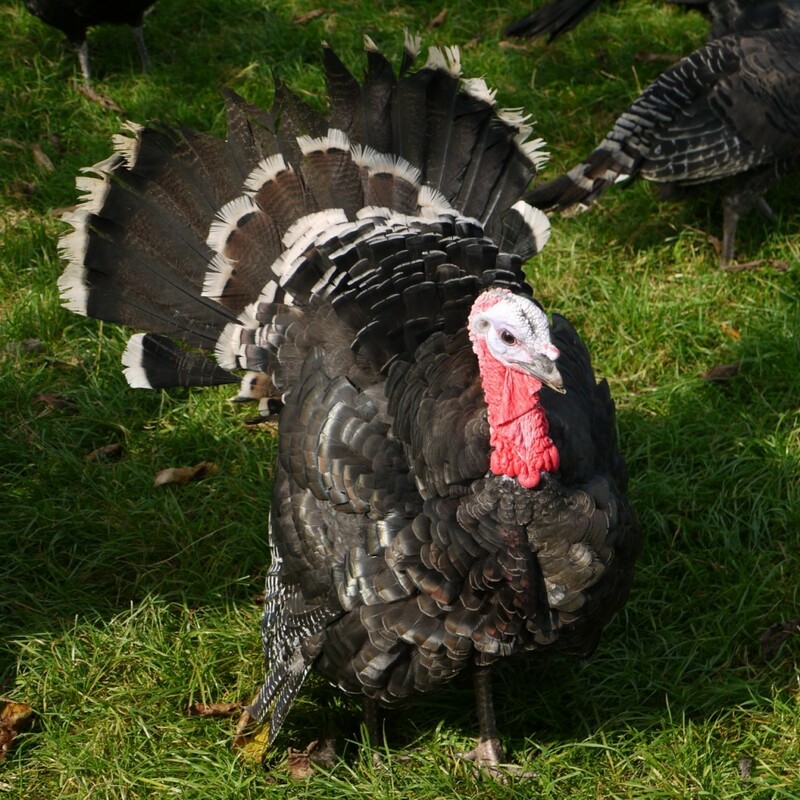 All the turkeys are grown to maturity and the different breeds provide the size variation rather than many producers some of whose turkeys are slaughtered younger to provide smaller birds. 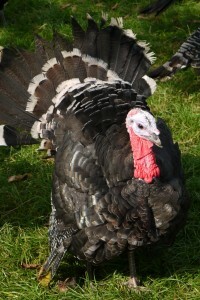 Copas say that for traditional breeds its the way the turkeys are reared rather than the breed that creates the flavour. Tom carves, plates are handed round and after a toast we tuck in. Its good, very good. Lots of flavour, moist, tender. The breast meat is excellent with a good balance of delicateness and proper flavour to satisfy everyone the legs are gamier and much more remisent of other birds. Some of each is a good contrast. Several people have seconds (this is getting rather like real Christmas) some of us are pretty full so save a little space for dessert. So will I be switching to turkey every Christmas?? That’s a really difficult one, now I know what excellent turkey tastes like and how to cook it…well its definitely much higher up my list but I’m a contrary thing and I’d probably still vary from year to year depending on who I’m cooking for. One things for sure I’d be seeking out a Copas turkey and if I was too slow and missed out (after all they do only rear about 50000 turkeys each year) then I’d be looking for something that was reared in a similar way from a farmer with high standards. Copas Turkeys have a Great Taste Awards Two Gold Stars (2010) and having been a judge for the 2011 awards I know how high the standard is to achieve that . Order your Copas turkey online or through one of the butchers who stock them. Be quick they sell out fast. I was a guest of the Copas family and Story PR. 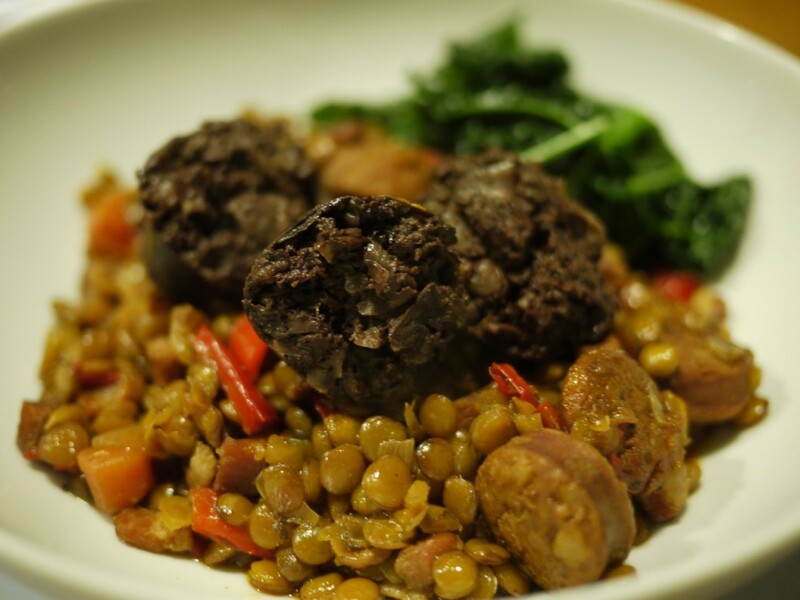 Last night I was chatting to fellow food lovers Gower Cottage Brownies and Presents Queen (aks The Foodie Gift Hunter) about cookbooks and in particular first cook books and the first things we cooked. Now as anyone who has read this post about food book I did knows I now have many many food related books….but of course a long long time ago I started with none…. This is genuinely the first cookbook I had that was my own. It was undoubtedly a gift but curiously I don’t recall who from. By the time I got it I suspect I already helped out cooking things like scones or fruit loaf with my mum and grandma. 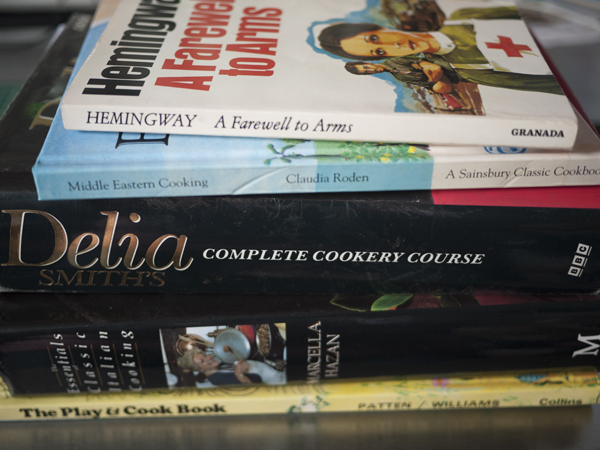 Neither had hardly any cookbooks and mostly cooked from memory or handwritten notes of recipes passed to them. We did have the Dairy Book of Home Management which I spent countless hours flipping though and looking at the pictures and projects. 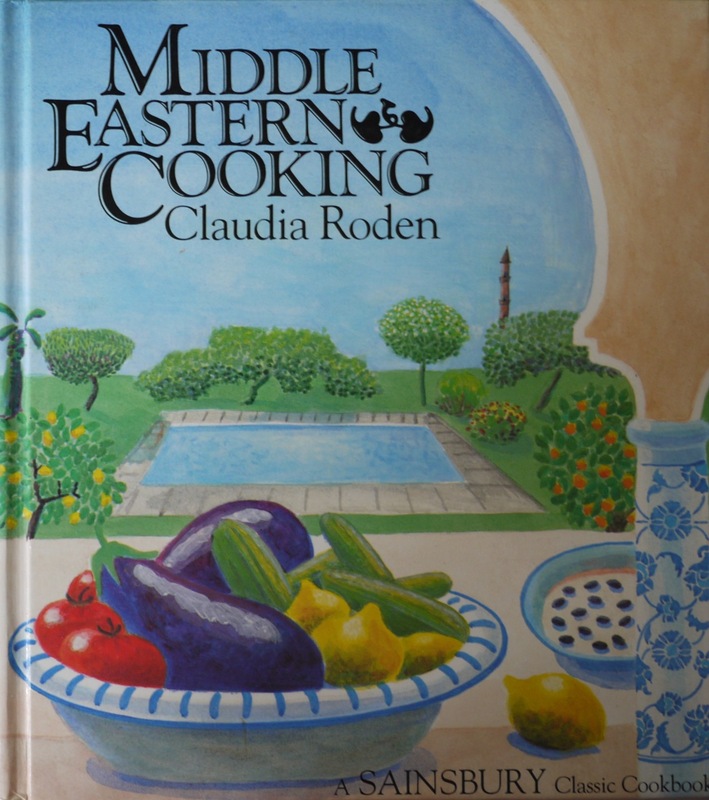 The book is in great condition mainly because I spent lots of time looking at it rather than cooking from it and also because I learnt very early to keep the cookbooks away from the action. 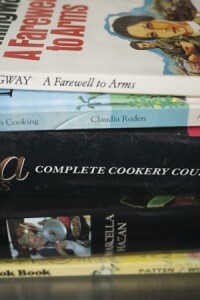 Even my most used cookbooks have no splatters! The three things I recall making from it are: Stuffed eggs, Eggs in a Nest and Rainbow Squares. The Rainbow Squares were a great disappointment it seemed impossible to get the coloured effect for each layer of the sweet even. The copy in the picture is actually my husbands, my copy has gone AWOL and is a BCA special smaller format on really thin paper…it’s been well used and the pages are falling out. It’s the book I really learnt to cook from. In truth I learnt to cook from my Mum’s copies of the three separate paperbacks printed to go with the television series rather than these subsequently compiled versions. The first recipe I remember cooking on my own is Normandy Pork with Cream and Apples as a welcome home dish for my Mum after she had been on a school trip, I was 14. Other dishes I recall fondly are Paprika Liver, Scone base pizza and Lemon cheesecake. It’s still the book I turn to fist for basics and timings, though i promise I don’t make scone base pizza anymore. I don’t care what anyone says about Delia this book is a great place to learn. Bonello sliced a big white cheese on the heavy kitchen table. The soldiers drink some wine and eat slices of cheese and then they move on and back to the horror of the war and the wet and the mud. In my mind there is a further passage where they simply cook pasta and slice cheese into it…I can’t find it now as I scan through, but the description stuck and the idea something as simple as pasta and cheese can be delicious stuck…and morphed into a regular recipe at home of creating pasta dishes from what ever we had (and calling the result pasta mix!). Of course any self respecting Italian is probably horrified by this gung ho approach…but there happens to be no Italian blood in my family and in Lancashire in the early 1980s I think we didn’t mind whether it was authentic or not just that it was easy, economical and tasted good. The idea lives on in dishes like this. 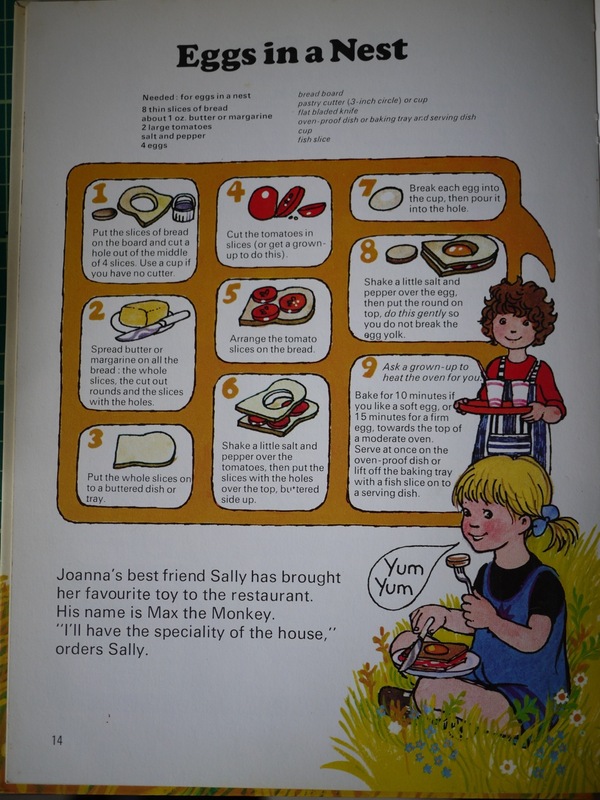 This is from a series that Sainsbury published in the mid 1980s and edited by Jill Norman. It’s got lovely vibrant illustrations by Julia Binfield. Supermarkets don’t seem to commission cookbooks as much these days but in the late 80s and early 90s there were great compact versions of books by well known authors to be had at bargain prices. I’ve quite a haul of them (not all are quite as nice as this in design terms). All of them though took me on a journey into cuisines I knew little about and got me to experiment with mexican, indian, middle eastern, chinese and more. My favourite recipe from this particular book is the Lentil and Spinach soup with Lemon…a wonderfully thick tasty soup thats easy to make. My first Christmas present from my husband, way before he was my husband. This is where I learnt to make fresh pasta, really rich ragu and the best ever lasagne, light yet full of flavour. It’s a sort of Delia of Italian cooking for me and the place I go to check first for an Italian recipe. All that without even knowing who Nigel Slater was….five books that have shaped how I eat and cook…what are your important five?? 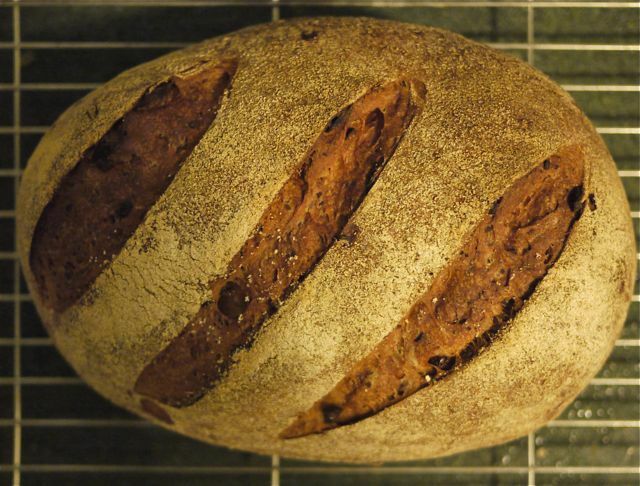 In my last post I talked about some of the bread I made in 2010 and said I was going to challenge myself to make a different loaf each week in 2011. To make its a bit more fun I decided to select two of my bread baking books and I’m going to bake my way through them both but in a RANDOM manner. I must select the bread to be baked randomly, using either a random number generator or by asking for numbers from people on Twitter. If the selected page doesn’t have a recipe on it then I moved forward in the book to the next nearest recipe. If the recipe is a sweet bread or bun I can skip in and do another random generated page number. WHY? because we eat so little sweet stuff I know it will get wasted. If the selection is something I’ve already made I do the next nearest recipe in the book moving forward page number wise. 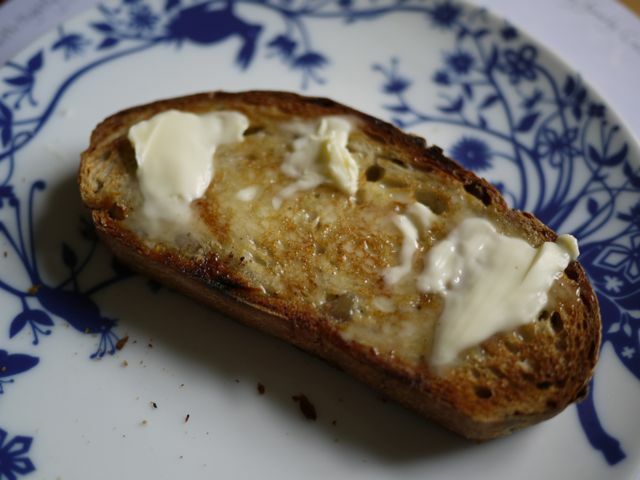 I blog each loaf at least with a picture and whether I think its a great recipe. The two books are River Cottage Bread Handbook and The Handmade Loaf. I’ve used both a bit last year so I know they are good. So what loaf is going to be first…. 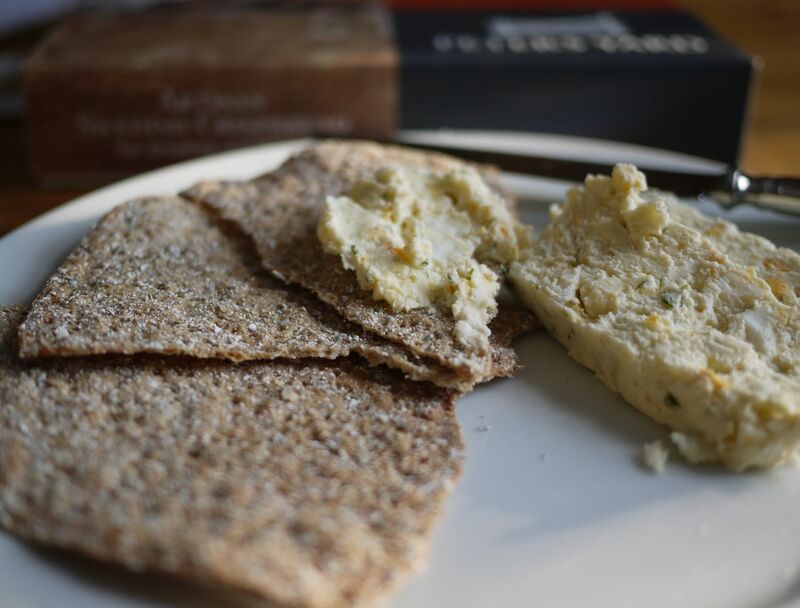 The first of the recipes from my festive menu is the cheese terrine we had as a starter with Peters Yard crispbreads and a selection of smoked and cured salmon from Forman’s. The terrine is adapted from a recipe in Delia Smith’s Christmas (the old version I’ve no idea if its in the recently published version). I particularly wanted to use a range of Lancashire cheeses but you could use any mix of cheeses you have and it would be a good way to use up what’s left of a cheese board. 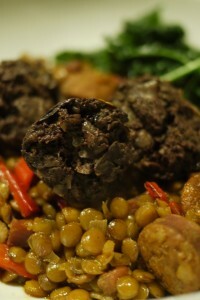 It makes a good starter or a light lunch dish (which is what I’ve been doing with the leftovers). 275g of cottage cheese or other mild young soft cheese, I used Lancashire curd from Butlers but I think Brock Hall Farm soft goat cheese would also be brilliant. Dissolve the gelatine as per the packet instructions. Blend the cottage/curd cheese with the mayonnaise/yoghurt until smooth. Cube the hard cheeses into 1/2 cm pieces. Whip the cream to the floppy stage. Add the dissolved gelatine to the soft cheese mixture and stir thoroughly. Add the hard cheeses, herbs, salt and pepper and mix. Then add the cream and stir through. Pour or spoon into the terrine mould. Cover with cling film and leave to set for 3 hours or more in the fridge. Turn out onto a plate and serve in slices or allow people to help themselves. Enough for 8 as a starter.